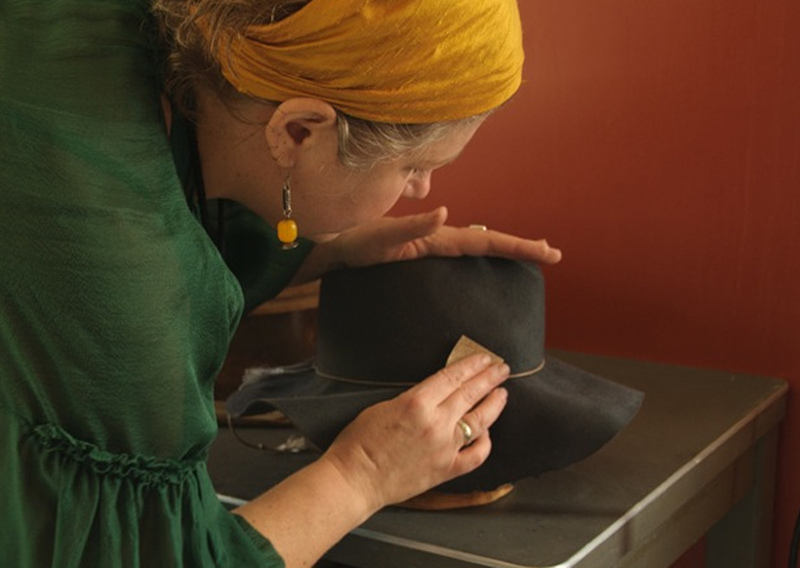 Milliner Deanna Gibbons, people have told me, is much in demand, and very busy making her elegant hand-blocked hats for Barney’s New York. So I hope for little more than a brief, formal interview as I climb the steep redwood stairs to her studio, perched atop a tall, narrow house on Alabama Street. But Gibbons greets me warmly at the door of her fairy-tale studio in the sky, and laughs as she leads me through its hats, hand-dyed ribbon trims, quaint vintage mirrors, antique millinery sewing machines, and then shelves upon shelves of her revered wooden blocks in the shape of every imaginable hat. Brushing aside the idea of a formal interview, she proposes to do some custom work for clients and at the same time teach me how to block hats. So my journey into this venerable craft begins. The block also demands respect. Finding the felt she is shaping a little too short to stretch completely over the brim block, she murmurs, “I could make marks and stick pins into the block, but you know blocks are tools, so….” And she finds another solution. Many of Gibbons’ blocks are carved by professionals, while others are vintage blocks from as far back as the 1920s. This particular block, her husband carved. Gibbons says few hats have the “fantastical” theatricality of the “giant, giant” ones she created for productions of “The Merry Widow” and “My Fair Lady.” Yet my lesson in hand-blocking makes me appreciate how any expertly hand-crafted hat can imbue the most ordinary clothes on the most ordinary day with a tint of drama and glamour.